Updated Monday April 22, 2019 by Admin. 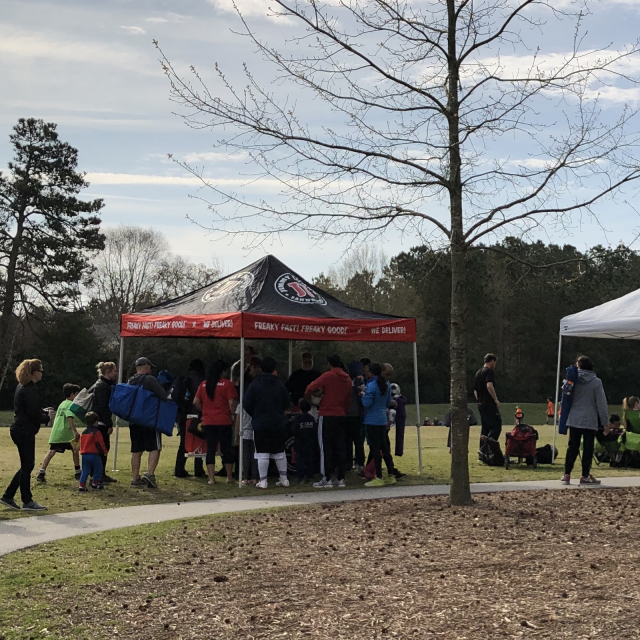 Jimmy John’s is a proud Premier Sponsor of the Futbol Club of Cary's Spring 2019 season. We had a great experience this past Saturday full of great weather and great samples! Jimmy John's will be back again on Saturday, May 4th giving away more samples and sharing how they can help with your team's outings and end-of-season catering needs. Jimmy John's is our preferred sandwich shop with convenient catering options to feed your hungry team. They've got Mini Jimmys®, Party Platters, Box Lunches and tasty sides. Whether you need delivery, pickup or setup, Jimmy John's has you covered! At Jimmy John’s, quality is a way of life. They spend 6 hours slicing and baking every day to make a 30-second sandwich. (That’s Freaky Fast!®) They bake fresh bread all day, so it's always served less than 4 hours out of the oven, and they slice all-natural meats and fresh veggies to perfection daily. To order, fill out the attached Catering Order Form or Box Lunch Form and email it to jjstonecreek@yahoo.com. For delivery, order at JimmyJohns.com or call the store at 919-461-0171. And don't forget to swing by the Jimmy John's tent on Saturday, April 13th for samples and more!